Standing out from the pack in the Maldives is not an easy task. 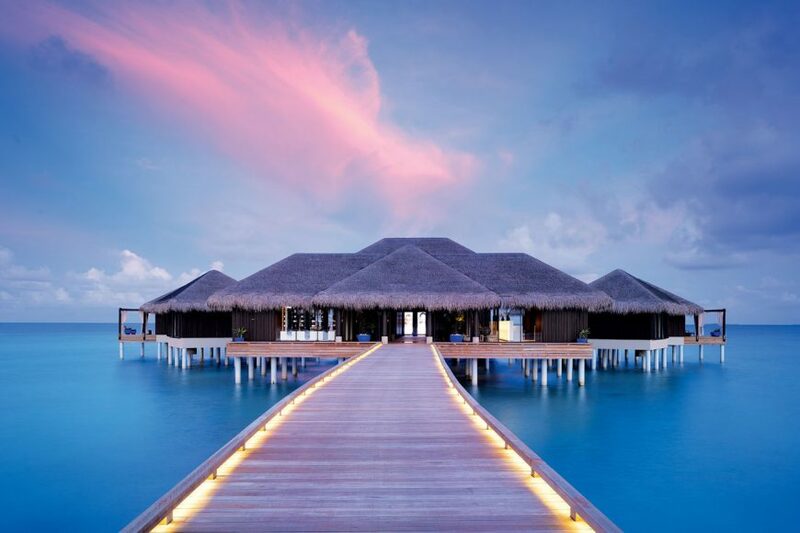 The country consists of 1200 islands within 26 atolls and boasts over 105 resorts, each equally unique and luxurious. However there are very few which are very truly private. Billionaire Jiri Smejc and his wife Radka were so passionate about the country that they decided to build their own private heaven and lucky for us, they have been kind enough to share it with the world. The island is their interpretation of how luxury should really look and their desire to create the most private place on earth. And boy did they get it right. Put simply: it is perfect. The island, the weather, the architecture, the food, the spa, the staff, the rooms, the service and the attention to detail. The island is so small you can circumnavigate it on one of the hotel’s baby blue bicycles in 5 minutes, give or take a few minutes to gasp in wonder at: Tevaru, the islands exquisite restaurant which is housed in the Maldives highest structure, the golf course and academy, the only covered tennis court in the country, the submarine (yep) and the spa’s unique snow room (more on these later). “Velaa” means turtle in the local language and upon approach looking down from the cloud free skies, can see that the island has been designed on the shape of the sea turtles that have inhabited the island for years, and are treated like local royalty. We experienced the royal treatment ourselves, from the moment we stepped onto this very special island, greeted by the champagne bearing welcoming committee, to the moment the seaplane whisked us away. Velaa is one of only a handful of hotels in the world who work alongside My Blend by Clarins and just like everything else on this island, offers an exclusive and unique experience, from the amenities to the treatments. The spa is fully equipped with outdoor Jacuzzi, steam room and sauna. And for that post sauna chill, experience the geographically defying “snow room” which wouldn’t be out of place on the slopes of Switzerland. This unique room is the only one in the Maldives, and contains mounds of compacted ice and snow. If things get too chilly, pop into the giant white cloud shaped snooze pod, the only one of it’s kind in Asia, in an isolated room slowly swaying to mimic being in the womb, ensuring a deep and almost trippy experience. We were lead by therapists, Swan and Bindu, down the wooden jetty to our treatment room, a standalone thatched cabin perched over the crystal clear ocean. Below each bed is a thoughtfully created light well, acting as a window to the ocean so that you can watch stingray or the occasional turtle pass by. 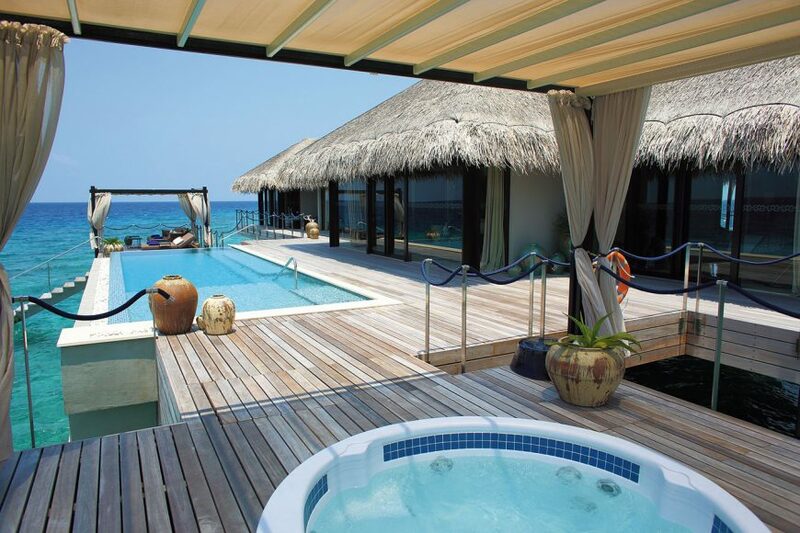 That is if you can keep your eyes open after you hear your therapist softly whisper “Breathe in the beauty of VELAA”. Here there is a holistic approach to wellness, and there are treatments that include Ayurveda to promote health. Try the Balance of Power facial, which uses a special facial technology machine to determine your skins needs, and a bespoke mix of products from the My Blend range is chosen just for you. There are plenty of villas to choose from – Beach Pool, Ocean Pool Villa/House, Private Residence, Sunrise/Sunset Water Pool Villas, and the Romantic Pool Residence. It all depends on how healthy your bank balance is – luxury doesn’t come cheap here. Don’t expect obvious and over-egged accommodation. ‘Polite Luxury’ is how they like to describe things. Nothing is gold plated or diamond studded, subtlety is key and fine details are attended to with care. In a successful attempt to bring nature into your living space, the villas are abundant with rich dark wood panelling (sourced in Borneo) double height ceilings which boast massive wind chime lights and driftwood and seaweed features. Floors are stone and wooden, there are sparkling walls made of varnished seashells and rattan swinging chairs that invite you to literally hang out and reflect on the beauty of this island. The bathroom, in a separate wing, is the size of a small apartment with a walk-in shower room looking out to the back patio through floor to ceiling glass windows and two gigantic stone sinks and two double wardrobes, should you feel needy. Pebbles and stones (that don’t absorb the heat) pave the way to an outdoor area which houses day beds, an outdoor shower and a large sunken tub. The bathroom, shower and outdoor areas are laden with an abundance of Clarins toiletries (full size bottles, not the mini travel-size nonsense we have become accustomed to). Athiri is the beachfront restaurant, half of the restaurant is set in sand with some chairs and tables even in water. For dinner, Athiri serves a beautiful uncomplicated menu of fresh Japanese, Italian, Indian and Thai options. The breakfast buffet here is the talk of the Maldives, we were pre warned that it is so overwhelming you have to take a breath and go slowly. The extensive buffet offers every flavour of the world and an à la carte menu to die for, including beluga caviar at a mere $450 per 30g! At the waterside sits the Aragu restaurant where the kitchen is overseen by executive chef Adeline Grattard, a veteran of two Michelin-starred restaurants. 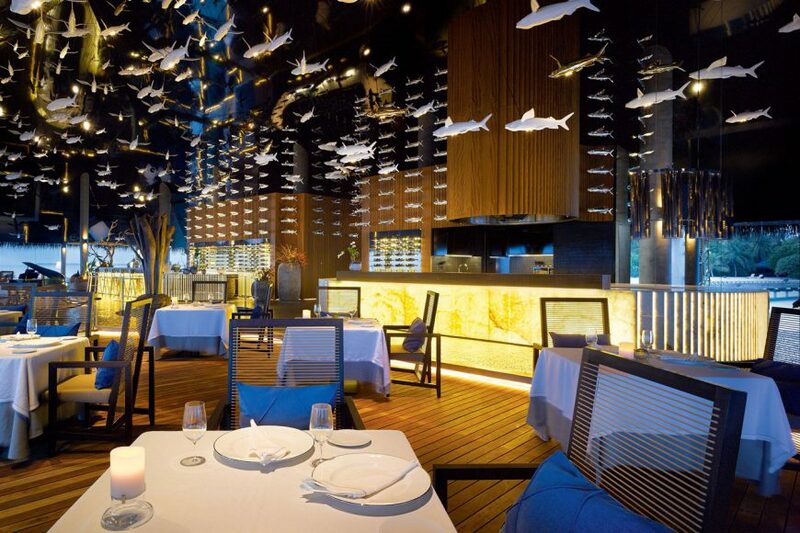 The exquisite design of this restaurant parallels the gourmet food, sitting underneath beautiful art in the form of hundreds (365 to be exact) of golden and porcelain flying fish dangling from the ceiling as you look out to the unspoiled views of the Indian Ocean. And last, but by no means least, the jewel in Velaa’s crown – the incredible Tavaru restaurant, which is housed on the top floor of an architectural masterpiece, a 21 metre tower. It sits on the fourth floor, atop three storeys of “wine cellar”, home to over 6,000 wines and holding an inventory of approximately £1,000,000. The activities at Velaa read like a to-do list for James Bond. The water sports centre is unparalleled with top class, high tech, big boys toys. Think sea bobs, jet-skis, a weta trimaran and a Top Kat K1 Catamaran. There’s also a dive centre, stand up paddle boarding, parasailing and kite surfing. Don’t be surprised to come across dolphins who stop by every day, and even baby shark (vegetarian apparently). 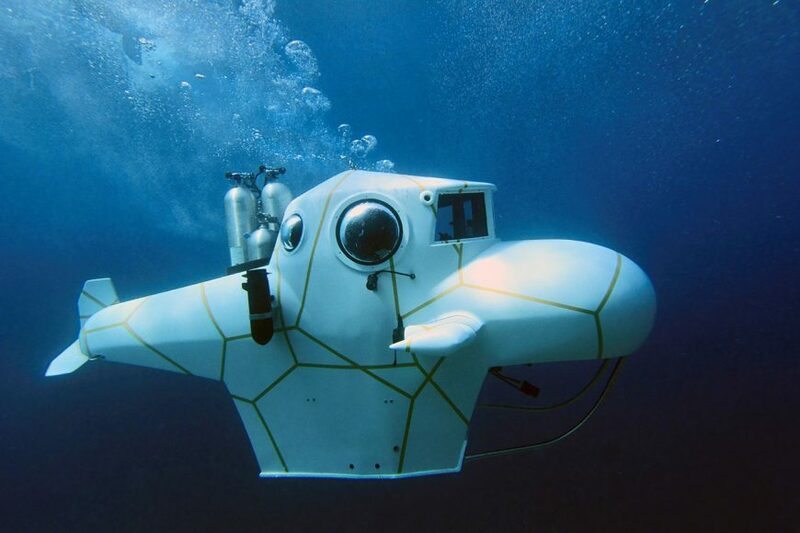 And then there’s the mini submarine to really help bring out the 007 in you. 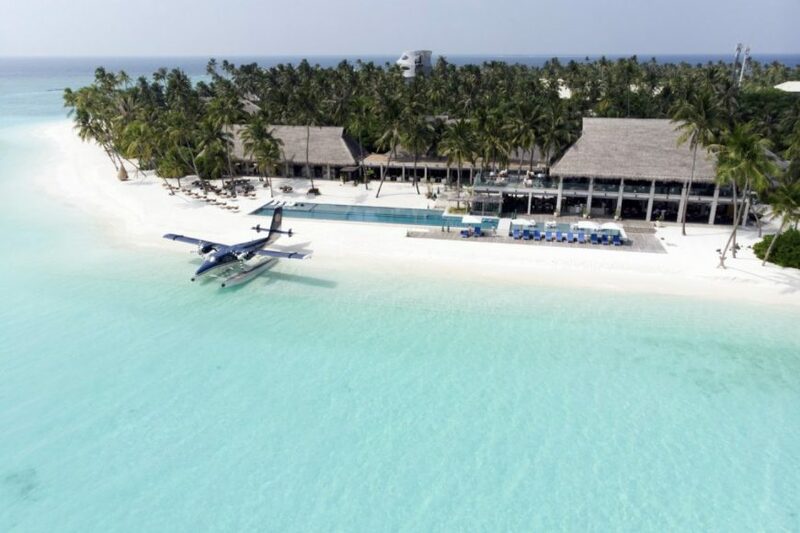 If you prefer to stay dry, head to the best recreation area in the Maldives where you will find a pristine covered tennis court, squash and badminton, and a golf academy with 170 metres of perfectly manicured greens – not to mention the indoor professional swing studio designed by Jose Maria Olazabal. Breathe in the beauty of Velaa – immerse yourself in deep relaxation and rediscover your inner peace and spiritual well-being. Offering the ultimate personalised experiences, the Spa can create a unique programme for the duration of your stay. Embracing a holistic approach to wellness, the Spa also offers a selection of Asian-inspired therapies including Ayurveda, Yoga and Meditation to enhance and promote health and longevity.